It’s just a fact of life: If there’s email, there will always be spam. 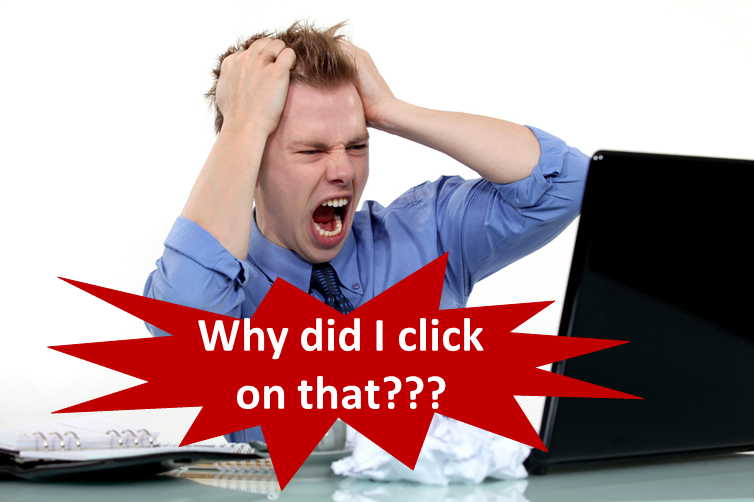 Now, how much spam you have to deal with will depend on how good your spam filtering solution is. Here at MDaemon Technologies, we use our own products – MDaemon and Security Gateway, to filter out spam, malware, phishing attempts, and all of the other junk that often floods inboxes of users whose email server or hosted service isn’t as effective. If an email security company or hosted provider tells you their spam filter will catch 100% of spam, they’re not being completely honest. Most companies say their products catch 99% or 99.5% in their SLA (Service Level Agreement), with a false-positive rate of %.0001 or less. That’s reasonable and to be expected, especially considering the statistics. 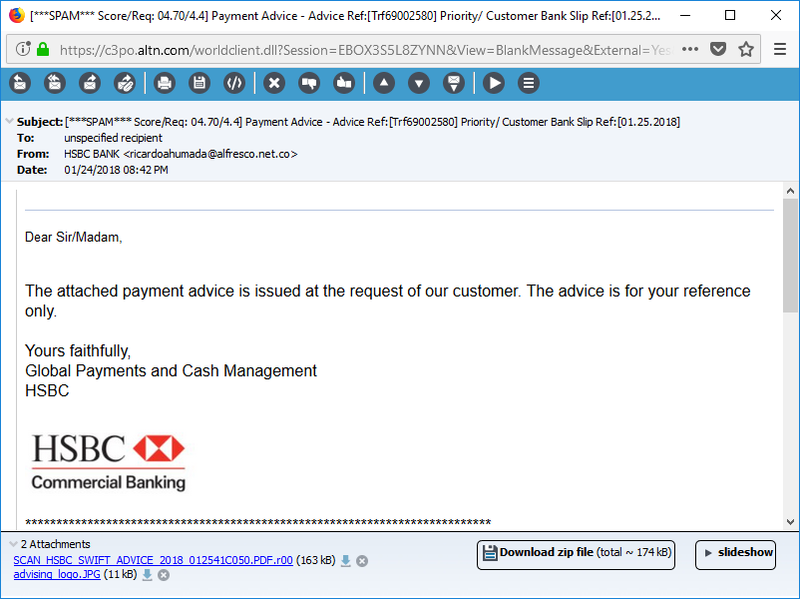 So no matter how good an email security product is, there is always that chance that new and emerging (and sometimes tried-and true) social engineering techniques will succeed in tricking the next unsuspecting victim to part ways with his or her company’s bank account details. And that brings me to the point of today’s post. It bears repeating that companies of all sizes and industries should consider ongoing training with their employees on how to recognize phishing attempts. 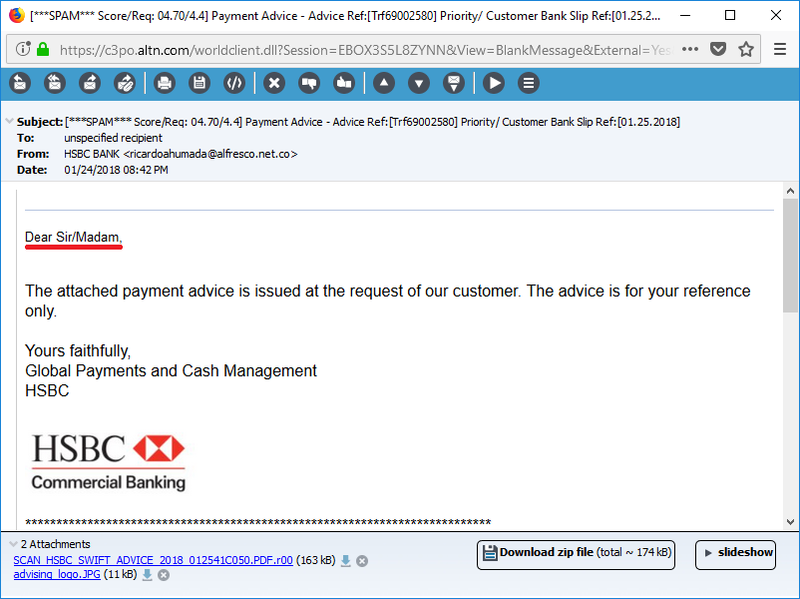 In today’s example, the scammer is using a classic BEC (Business Email Compromise) attack to try to get the recipient to open a malicious ISO file. Because the threat of phishing and Business Email Compromise will continue well into the future, I will revisit this topic regularly throughout the year. 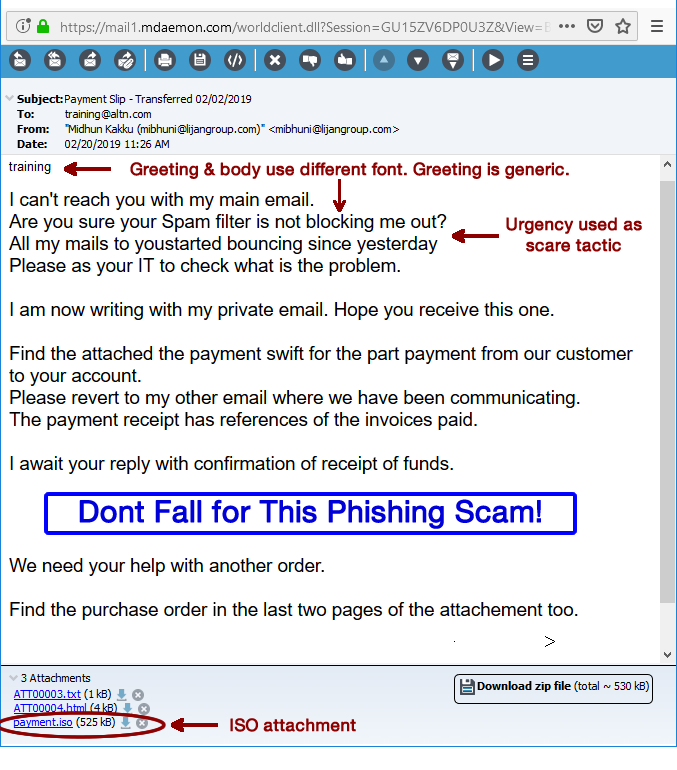 Meanwhile, I would recommend sharing with all employees and business executives these 10 best practices for avoiding common email scams. How to Encrypt your Email Messages from MDaemon Webmail in Three Easy Steps! Whether you work in healthcare, finance, education, or another highly regulated industry, it’s likely that you’re required to meet increasingly stringent regulations on email security and privacy, such as the General Data Protection Regulation (GDPR). But even if these strict requirements do not apply to your industry, you still want to maintain customer trust by ensuring their confidential data is safe. To address these concerns, MDaemon offers email encryption using OpenPGP. In the past, implementations of OpenPGP have been cumbersome, requiring users to manually exchange encryption keys or to take complex steps to send encrypted messages. With MDaemon, in addition to providing various ways to automate the encryption key exchange and server-side encryption processes, MDaemon Webmail users can easily enable per-message encryption right from within the message compose window. Here’s a quick video to demonstrate how easy it is to encrypt messages in MDaemon Webmail. A more comprehensive overview of MDaemon’s OpenPGP settings and how to configure them can be found in this knowledge base article. Upgrade MDaemon to Take Advantage of the Latest Features! Are you running an older version of MDaemon? Check out our Features by Version chart to see what you may be missing out on! Server-side email encryption with OpenPGP was introduced in MDaemon 15.5. Click here for upgrade & renewal instructions. If you’re not currently using MDaemon and would like to see how an affordable, easy-to-use mail server can benefit your business, click here to download your free trial! Has this happened to you? Let’s say you’re the MDaemon administrator for your company, and you’ve noticed that somewhere, somehow, spam messages are being sent from within your network. Perhaps one of your PCs has been compromised. What do you do? Here are some tips to help you track the issue down. 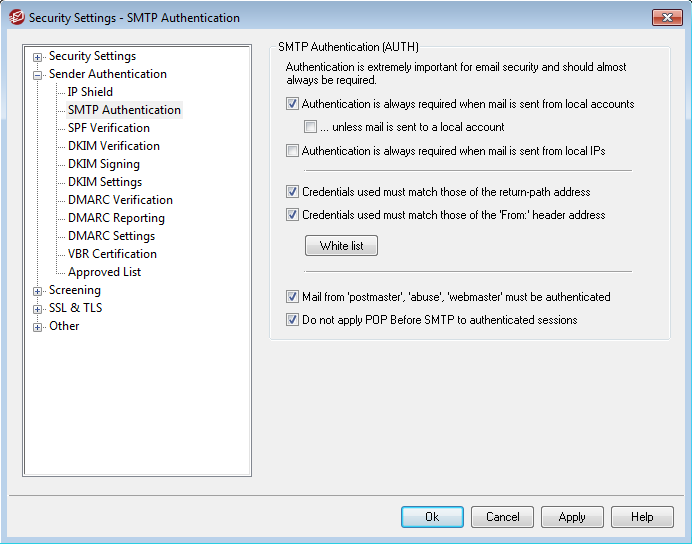 First, make sure you have the option “Authentication is always required when mail is from local accounts” enabled (Security | Security Settings | SMTP Authentication). Also enable “Credentials used must match those of the return-path address” and “Credentials used must match those of the From header address.” Then, make sure “…unless message is sent to a local account” is unchecked to prevent intra-domain spam (between local domain users). If this header is present, then that is the user who authenticated to send the message. The first thing you should do in this case is to change the account’s password via the Accounts menu in MDaemon. Even if the spamming is going through the user’s mail client, until you give the user the new password and they update their mail client the authentication credentials will be rejected and the spamming will be temporarily stopped. 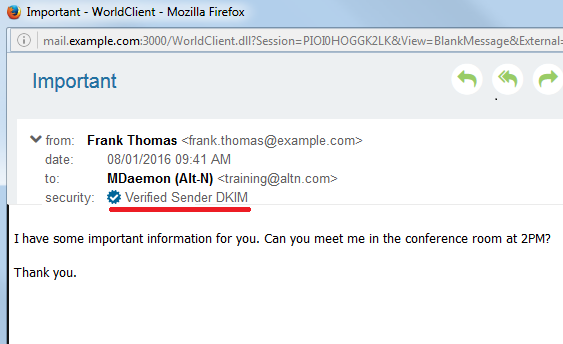 In newer versions of MDaemon, we’ve added Account Hijack Detection, which will automatically disable an account if it sends a specified number of outbound messages via an authenticated session in a given period of time. We recommend enabling this feature. In MDaemon, it’s located under Security | Security Settings | Screening | Hijack Detection. Find the connecting IP (192.198.1.121) in the above example. This is the machine that is sending out spam. Locate that machine to deal directly with the spambot on that machine. If the message wasn’t authenticated or wasn’t sent from your local network, locate the Message-ID header and copy that value. 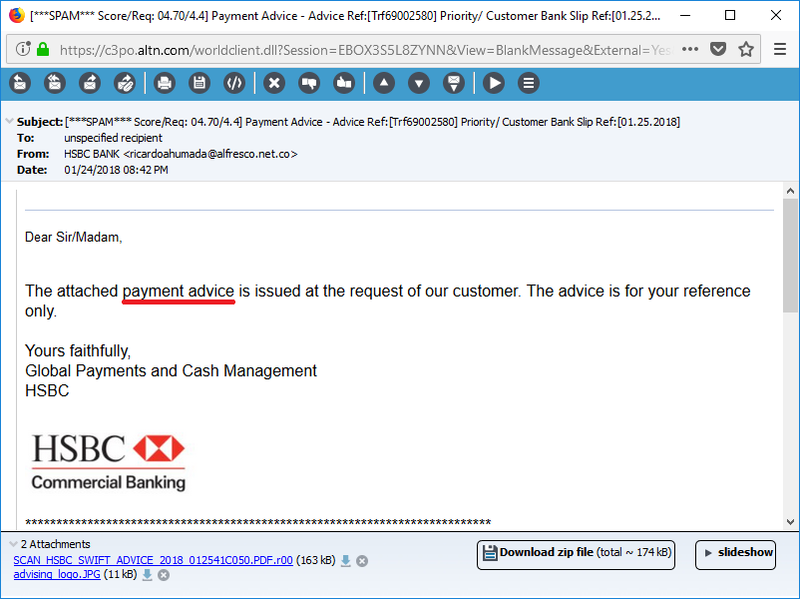 Look at the rest of transaction and see why the message was accepted/not rejected – spam score, DNSBLs, etc. Also, if your external domain is listed in the Trusted Hosts list (Security | Security Settings | Trusted Hosts), try removing it from this list. Check back often for more tips & tricks! Our latest version of MDaemon, MDaemon 17, comes packed with lots of new features for administrators and end users, including new password security, support for Let’sEncrypt, DropBox integration, message scheduling, and much more. Today, I’d like to demonstrate MDaemon’s new Health Check utility. With this handy new tool, administrators no longer have to go through each feature to verify that it’s configured for optimal security. This new tool will analyze all security-related settings, display each setting’s current value, its recommended value, and where that feature is located in the MDaemon interface. This tool offers administrators the flexibility to change all settings to their recommended value at the same time, or to select and change individual settings. In this tutorial video, I demonstrate how to use the new Health Check utility. Need additional help? More guidance on the MDaemon Health Check utility can be found in this knowledge base article. If you haven’t yet upgraded to MDaemon 17, check out the release notes and our previous blog post to see what you’re missing! Recently, I created a video and blog post about Virtru Email Encryption for MDaemon, to demonstrate its features, benefits, and ease of use. Following along with its ease of use, I’ve created the following animation to show you just how easy Virtru is to use. Simply enable Virtru support in WorldClient (MDaemon’s webmail client), enable the Virtru features by clicking on the small “V” button within the email compose window, and then click on “Send Encrypted.” It really is that simple! For a more thorough overview of Virtru’s features, please see this blog post, or click here to visit our main Virtru page. 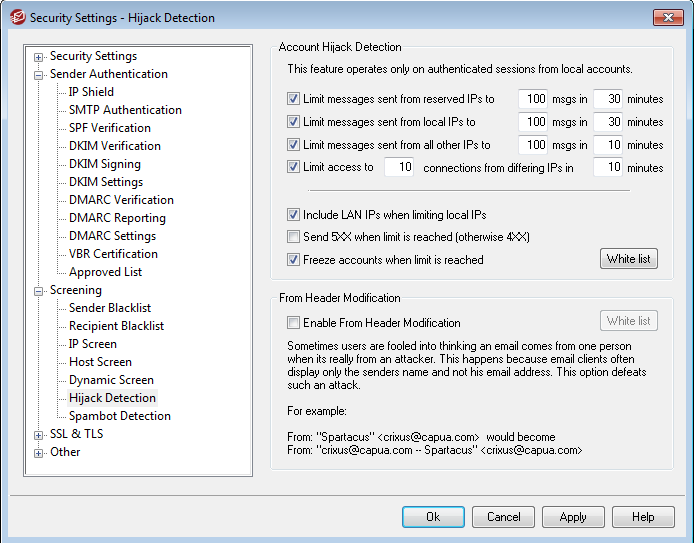 Virtru (email and attachment encryption) is included with the MDaemon Messaging Server. Virtru Pro features include Message Revoke, Disable Forwarding, Set Message Expiration, and automatic encryption. Click here if you’d like to purchase Virtru Pro. Want to learn more about the encryption features offered by MDaemon? Then click here to learn more! Protect your business from unauthorized access to your important and confidential email messages. Download your free trial of MDaemon today! Have you ever created an account on a website that you wouldn’t want others to know about, or made travel arrangements, purchased personal items, or set a doctor’s appointment online? If so, then it’s possible that sensitive information about you has been transmitted via email. If any of these situations apply to you, or if you just don’t want anyone to see the cat photos you sent as an email attachment to your neighbor, then you should be encrypting your email. 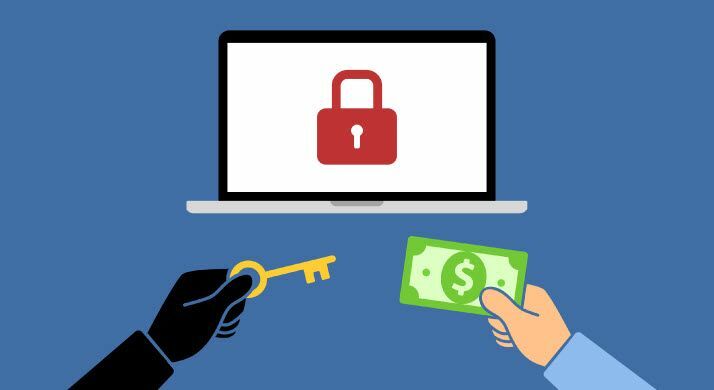 If you send personal or financial information, it’s best to assume that at any given time, someone out there is trying to gain access to that information. Many small businesses think data breaches only happen to large companies, however, no company is too small to protect itself from outside threats. In fact, many hackers know that smaller companies might be a bit more lax in their security practices, and thus target them more aggressively. This is why email security and encryption are so important. Firewalls, antivirus, and anti-spyware may provide good protection, but they may not be enough. If one of the above is breached, encryption helps keep data safe. Encryption can help shield businesses and users from government surveillance or other unauthorized access. When you need to send sensitive data, encryption helps keep this data away from unauthorized viewers. Encryption helps companies stay in compliance with HIPAA, CJIS, FERPA, and other government regulations. Encryption helps keep sensitive data out of the hands of criminals and competitors. Encryption helps companies preserve data integrity and privacy policies. Now that we’ve discussed why encryption is important, let’s discuss Virtru and its benefits. First, we need to make a distinction between client-side and server-side encryption. With client-side encryption, email messages and attachments are encrypted by the sending mail client, and remain encrypted until an authorized recipient opens the message. With server-side encryption, messages and attachments are encrypted on the mail server with no user interaction. MDaemon users can use Virtru to encrypt messages on the client, and MDaemon administrators can use PGP to encrypt messages as they pass through the mail server. In this blog post, we’re going to focus on the client-side Virtru encryption features. If you’d like to learn more about MDaemon’s server-side encryption options using OpenPGP, then check out this blog post & video. Virtru is an easy to use email encryption service that lets you protect private information while using your existing email service. Encryption converts plain text into gibberish (cipher text) that is unreadable to all except the intended recipient. Virtru offers end-to-end encryption, ensuring that only authorized parties can decrypt your content. When you send messages with Virtru, your emails and files are locked using strong encryption. Only you and your recipients can decrypt your messages. Separation of content and encryption gives you an extra level of privacy. Virtru was designed for user privacy and ease of use. Virtru never has access to your passwords and does not store any of your email content on their servers; only the encryption keys. Virtru helps users avoid headaches by managing their encryption keys for them. Users have two versions of Virtru to choose from. The free version provides encryption and decryption of email and attachments. The Pro version provides the same encryption and decryption features, plus the ability to set message expiration dates, revoke emails, and disable forwarding. Want to learn more about Virtru? Then check out the video below for a demonstration, or visit the Virtru page on our website. You can also try out Virtru’s features by downloading your free trial of MDaemon. Whether you work in health care, finance, government, or any other field that requires the storage of data, there’s always someone out there who would love to gain access to your confidential records. Don’t let the bad guys steal your data. Protect it with server-side encryption. Our latest release of MDaemon supports OpenPGP, which allows MDaemon to perform encryption, decryption, and key management tasks. Learn how to enable OpenPGP support in MDaemon, and how to send encrypted mail in our latest video. Click here to learn more about MDaemon’s email encryption features, or click here to download your free trial of MDaemon and see for yourself how easy it is to use!